77 Sunset Strip / Hawaiian Eye, etc. Discussion in 'TV on DVD and Blu-ray' started by Frank Soyke, Mar 7, 2011. Good eye for spotting all these details in the episodes, Dolly! I always thought the top parking lot at Dino's was much too small for size of Dino's restaurant started looking , using, slow & pause. I found the their lower parking lot. Refresh my memory--who won that game? Wow, you were SO fortunate! Rose Bowl tickets are as rare as tickets to Heaven around here, even though the stadium seats 75 million. Our Councilman gets two, and he always raffles them off (gratis) to a denizen of his district. I've never been inside the Rose Bowl. And your old dorm mate must have done well for himself. A stone's throw from the Rose Bowl is an elite neighborhood. Two stone's throws, not so much. If it's a comfort to you, the Mary Webb Davis building had already morphed into the Tiffany Theater well before then. Wow! You've never been in the Rose Bowl! My husband & I have been to the Rose Bowl twice: the 1995 Rose Bowl played Mon., 1/02/1995, & the 2009 Rose Bowl, played 1/01/1999. We've seen Rose Parade 3 times. The Rose Bowl parking lot , both times we were there was a free for all. The cars were parked all which ways. The Rose Bowl didn't have anyone directing the parking. Everybody in there was tailgating. WHAT A MESS!!!!!!!!!!! We paid $145/ ticket to PSU for 2009 Rose Bowl tickets. 64,500 tickets are a contractual sell out , allocated to the particaping teams & conferences.. Rose Bowl Stadium has 90,888 seats and the all time record for spectators: 100,000. PSU's stadium has 100,000 seats and the all time attendance record: over 111,500. We had to walked 75% around Rose Bowl Stadium in 2009 to be told at the correct entrance our tickets were no good. We had the paperwork that we got our tickets from PSU.. We then had to walk the rest of the way around the stadium to the Guest Services Stadium Window where we saw former famous PSU players picking up their tickets at the Will Call Window. At the window, she called somewhere & we ended up in the USC section with much better seats than we probably would have had. The USC people were very nice to us. The reason our tickets weren't any good : some other people lost their tickets & got replacements from PSU. We were somehow credited for that. We didn't lose our tickets. So, we were given tickets for entrance to the Rose Bowl game. When we got home from LA, we called PSU & told them of this problem; PSU didn't even give us an apology. So, probably somewhere there is built into the system, what to do when something goes awry. criblecoblis, Lutz Koch and Flashgear like this. Astounding! I deeply love the Loop area, and my recent visit only reinforced that. It's a spectacular cityscape. And count my mind blown at our being in the same cityscape at the same time. I was just eighteen, and at that time the drinking age in Illinois was eighteen. So I went to a disco and had a beer, and felt quite wicked. I also deeply love propinquity. Our being in Chicago at the same time reminds me that my wife and I were in London at the same time--four years before we met. Oh, and that's not all. WELL before that, we were both at the San Diego Wild Animal Park, watching the Smothers Brothers. My husband & I have been to Chicago once. The Loop was impressive. Soldier Field was nice. We saw saw the Egyptian Exhibit at the Museum. Lake Michigan was was pretty & much more expansive than I thought. The shopping was fabulous. The security for the garage parking lot was incredulous. Before allowing our car in the parking garage there was this rod run under & all around the car. I imagine it was to detect explosives; only place that has ever happened. We drove around North Western Stadium and University. Navy Pier was interesting. Correction: The 2009 Rose Bowl was played 1/01/2009. Lutz Koch, Flashgear, Rustifer and 1 other person like this. Since you mention it, I was walking around Colorado and Lake last night. In the 40 degree weather! They've really done great things with the block of El Molino south of Colorado! My wife and I plan to explore it when the weather warms up. Nope. But I have marched in the Rose Parade! That kinda brings it back on topic a bit ("Bullets for Santa"). That was sure a nightmare they put you through regarding the tickets! I'm glad the USC folks were nice to you. Dolly8, Lutz Koch, Flashgear and 1 other person like this. Twice for me. A soccer game in 1978. And the final Gold Medal soccer match in the 1984 Summer Olympics. It is something of an anomaly that I've never attended anything at the Rose Bowl. The next time USC is in the game, maybe we'll try to get tickets. I wouldn't mind going to the annual 4th of July fireworks show at the Rose Bowl sometime. We can see the higher elements of that show from our house. Between that and the Altadena Country Club, it sounds like a war zone here around the Fourth. Dolly8, MartinP., Flashgear and 1 other person like this. I also deeply love propinquity. I get so tickled when you spring words like 'propinquity' and 'bien pensant' on us, Rob. You wield word power as easily as I exercise a fork through mashed potatoes. It's awesome. I deeply love the Loop area, and my recent visit only reinforced that. It's a spectacular cityscape. I know downtown Chicago as well as I know my own neighborhood here in Indiana. Almost every restaurant, museum, shop, hotel, stadium and park has felt the trod of my feet through it at some time in the past 45 years that I've lived or visited in the town. Wifey and I made a pilgrimage there on every one of our past 32 anniversaries. We've missed the last two years for unavoidable reasons. When I was a poor starving artist in Chicago, I promised myself someday the luxury of staying at the Drake whenever I could finally afford it. I've probably stayed there a hundred times since then. My Dad, who lived in Chicago almost his entire life, had never been to that storied hotel. For his 90th birthday, we checked into the establishment--setting him up in the Presidential Suite. I almost had to burn rags in the fireplace to get him to finally leave. Okay, I've reminisced enough. I promise to return my attention to the subject of this thread. Lutz Koch, criblecoblis, Dolly8 and 3 others like this. 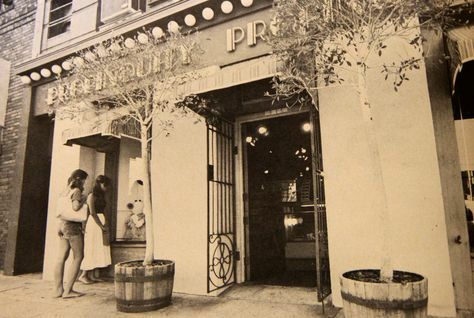 I knew the word "propinquity" because many years ago there was a store in the neighborhood with that name. Lutz Koch, Flashgear, criblecoblis and 2 others like this. Somebody was smoking some weird sh*t to come up with a name like that for a retail establishment. Lutz Koch, Flashgear, criblecoblis and 1 other person like this. I get so tickled when you spring words like 'propinquity' and 'bien pensant' on us, Rob. You wield word power as easily I exercise a fork through mashed potatoes. It's awesome. Well, as I've mentioned, Dad used Stu Bailey as a template for raising me, so I tend to speak like Stu (and on my own initiative Kookie as well at times). Besides, I know you all can catch whatever I may throw. I know downtown Chicago as well as I know my own neighborhood here in Indiana. Almost every restaurant, museum, shop, hotel, stadium and park has felt the trod of my feet through it at some time in the past 45 years that I've lived or visited in the town. It's a beautiful, exciting city, really the only one I know outside of California. I never appreciated my own city until I saw Chicago. We went to Lou Malnati's when we were there in December (my brother and his son kept making "Illuminati" jokes). Now we know what authentic Chicago-style pizza is. What a lovely story! You're a good son. Yes, there's nothing like staying in a truly good hotel. Our big indulgence for some years was the Ritz-Carlton Huntington in San Marino; we stayed there on our wedding night and for four anniversaries afterwards. Then, the price doubled, and we decided that there's really no place like home. Dolly8, Flashgear, Gary16 and 2 others like this. While I appreciate living in the LA area, I am constantly surprised to discover that Pasadena itself is a year-round tourist destination. Sure, I get why people want to come here around New Year's, but Colorado and Lake are lined with obvious tourists in the 100-degree weather of August. That I don't get, because at that time I'm wishing I were somewhere else. During our early visits in the 80s, wifey and I always stayed at some motel in Hollywood, mainly because it was easy to get almost anywhere fast from there. Later on, when the rates in Hollywood began to increase dramatically, we discovered Pasadena as a real nice base of operations, and a very nice place per se. One of the Best Westerns on E. Colorado became our preferred choice. I remember it was not too far from Cameron's Seafood restaurant where we twice went for dinner - just great! And so it happened that upon our final trip to California in late summer 2007 Pasadena became the place where we spent the final few nights. A trip to Lake Arrowhead was the last thing we did from there. But we didn't leave before a last goodbye to Old Town Pasadena and the surrounding area, briefly glimpsed in this short video clip. Dolly8, Flashgear, criblecoblis and 2 others like this. I love your personal videos of areas you and your wife have visited in SoCal, Lutz. I wish I would have had the presence of mind to do the same on my many trips to LA. Kudos to you! Since we've spend some time talking about Pasadena, I thought it only proper to pull up this episode to watch. I think Rob already did one of his fine Viewer's Guides on this one, but I avoided going back to check it for fear of inadvertently copying some of his thoughts into my own spin. In my advertising days, our definition of creativity was 'plagiarism gone undetected'. The story starts out rather grimly--dredging a car out of the bottom of Long Beach. There's a body inside that's been marinating in seawater for a year and a half. Identification is going to be iffy, but leads Stu Bailey to the home of old Rachel Baker (Hallene Hill) and her equally spinster-like housekeeper Lavinia (Elizabeth Patterson). Both live in a mansion whose parlor looks like the final repository of at least 100 grandmothers' discarded furnishings. It's suspected that the dead body belongs to Rachel's son Peter who's been missing for over a year. Rachel is mostly interested in collecting his life insurance. Between Rachel and Lavinia, Stu suspects there's foul play afoot. In order to extend his stay for deeper investigative purposes, he conveniently trips over a phone cord and fakes a Monty Woolley-type back injury. Jeff Spencer assumes the role of Stu's doctor and immediately diagnoses the injury, "It's obvious your second coresis is impinging upon your lower petunis". Stu is bodily deposited in the spare bedroom by groundskeeper Leo (Pat Cominskey) who stands about 8'3" and weighs in around 476 lbs. Stu spends most of his "recuperation" in a nightshirt apparently borrowed from Ebenezer Scrooge's closet. His focus is on accessing Peter's locked room, which most likely holds a trove of clues. Meanwhile, Jeff digs up Lavinia's son's ex-wife Kim (Carol Kelly), a cigarette girl in a dive bar on the Strip who provides information on her ex's whereabouts over a couple of bottles of Irish whiskey. Jeff gets the snot beat out of him upon leaving her apartment by a couple of goons--we're never fully made aware of why. Eventually Jeff finds Lavinia's son in a bar in Mexico, and the mystery is finally solved via uncovering the greediness of the two old biddies. It's a pretty nifty ending. This is a delightful story that highlights the lighthearted detective scripts that made 77 SS so cool, but not employed nearly enough in the latter seasons' efforts. Directed with a deft hand by Montgomery Pittman, the sets look like WB blew about a half season's budget on this one episode. There's an obvious tinge of Arsenic and Old Lace here. Rachel Baker's address is identified as 468 Sherwood St.--which actually exists in South Pasadena. However, I suspect the actual house used in the episode is situated on WB's backlot "neighborhood". Pat Cominskey was a professional heavyweight boxer between 1938-1951 with 88 bouts and 60 KOs to his credit. He was generally cast in bodyguard roles in several TV series in the 50's and 60's. Dolly8, Gary16, Lutz Koch and 2 others like this. Nice review of "Pasadena Caper," Russ! Ooh, great find! The funny thing is that we drive right past that house on the way to church, and I've never realized that it's the address of the house in this episode. I can tell you that the neighborhood in question seems to have been developed after WW II; there are no Victorians in evidence in that area. Nevertheless, it's hard to imagine that Pittman would make up an imaginary Pasadena address that just happened coincidentally to be a valid South Pasadena address. I wonder what the truth of the matter is? I actually obsessed over the house used in the episode. I'm fairly sure that the exterior and interior are different structures, because of certain obvious discrepancies. I used to think that the interior was an actual house somewhere in Pasadena, but I now suspect that the interior is either a built set or a different backlot house. I keep hoping that I'll see the house in some old WB film. Dolly8, Mysto, Gary16 and 3 others like this. A couple of thoughts: I found a pic of this house from WB's back lot, although I'm not sure whether its the one used in the episode. I wonder if the scene with Jeff and Stu sticking their heads out of angular-facing windows was shot here on the backlot? Probably not--as it looked more like a stage set that was built for the scene. Sure fun, though, to do some detective work on possible locations and addresses. Flashgear, Lutz Koch, Mysto and 1 other person like this. Damn nifty covers, though. Arty, eh? ponset, Flashgear, Lutz Koch and 2 others like this. The image is cropped at the top in this Me-TV print, but if you delete the veranda from the house in this image, you can see that the shape of the house is the same, and the door and windows are all in the same place (although they deleted the two side windows in the second floor bay). Note that the windows are obviously quite different from those of the house used for the exterior. These have leaded windows in a distinctive design. Moreover, before Stu and Jeff come to the windows, you can see that they are definitely in Stu's room. I would also point out that the shadows in this photo strongly suggest one light source, which leads me to believe that this is a genuine exterior, although it's certainly possible that this is a built set on a sound stage, or another house on the back lot--but if it is the latter, then why didn't they just use this house for the exterior establishing shot as well? Again, great investigative work, Russ! Dolly8, Flashgear, Lutz Koch and 2 others like this. Martin, while I don't recognize the store, I do recall ads in the Times for a store with that name, and the word struck me as so odd that I was motivated to look it up. Note the small jockey statue in front of the house. In the episode, Kookie parks his hot rod in front of it and says, "Watch the horses for me, dad". Lutz Koch, Dolly8, criblecoblis and 1 other person like this. I don't know whether I've already flogged this to death, but after seeing Russ' later photo of the Baker house exterior from "Pasadena Caper," I took the Googlemobile for a ride around the backlot, and I've found the house from 2016, again quite changed from Russ' photo. Fortunately, it's one of the houses you can drive inside of, and it is definitely not the house used for the interior. It doesn't have a second floor; the ceilings are all open to facilitate lighting and sound. Also, the street layout around this house matches that of the Baker house. EDIT: I realize that I should mention that I have screen shots of my Googlemobile foray, and could provide documentary evidence of my assertions if desired by acclamation. Lutz Koch, Rustifer, Dolly8 and 1 other person like this. Fine review. Your reviews make me laugh! Rustifer and criblecoblis like this.